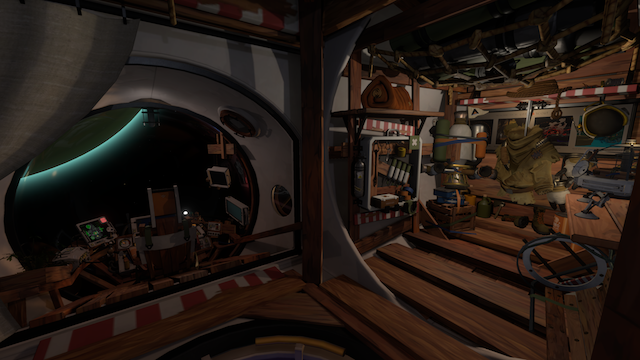 Recently, Annapurna Interactive invited 411mania to check out an interesting new, first-person video game called Outer Wilds. Outer Wilds is a new first-person space simulator and exploration game developed by Los Angeles-base game creator, Mobius Digital. 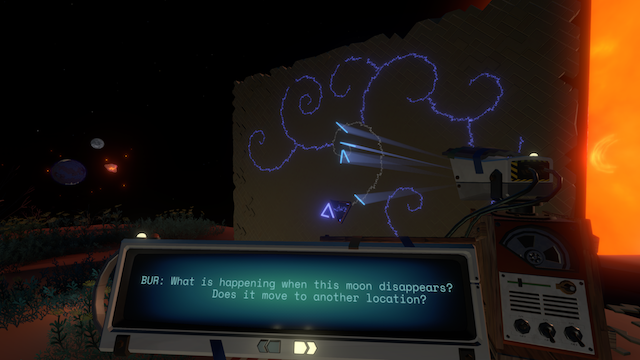 In Outer Wilds, the story focuses on a mystery within an alien solar system. Players assume the role of an astronaut for a unique alien species. And after getting a space suit, equipment and space ship, players are able to fully explore the solar system around them in order to unlock a mystery involving another ancient alien race. Unlocking this mystery could mean the salvation of the future for the alien astronaut’s home species. At the start, you are able to explore the astronaut’s home planet and get a handle on working in zero-gravity, and you can explore the museum of ancient artifacts. One particular artifact has a mysterious connection to the astronaut that’s integral to the journey in the demo. The astronaut’s alien culture has a very outdoorsy look and style. They basically look like a race of boy scouts. You can even sit by the fire and roast some marshmallows. Eventually, you are able to make it to your spacecraft to launch into orbit and prepare to travel to the other planets in the solar system. All the environments are in full 3D. The game has a heavy focus on exploration and outer-space travel. The game has first-person controls, but navigating the space craft does have a bit of a learning curve. Additionally, the various planets in the solar system that you can travel to are all very unique. They all have dynamic weather systems or features that can make exploring them rather hazardous. One planet in the demo featured ruins of an underground city. However, the city is being buried under a mountain of sand. This rising sand level has to be utilized to explore the environment, but it can also become an obstacle. Not to mention, it’s important to keep track of the astronaut’s oxygen levels so he doesn’t suffocate. Another planet’s atmosphere was full of vortexes that your space ship can get trapped in, and it will send you spiraling back into orbit. There is a time limit function to Out Wilds that’s slightly reminiscent of The Legend of Zelda: Majora’s Mask, which the developers tell me was a big inspiration for them. Without giving away too many details, there is a type of cataclysm involved. And the astronaut has been trapped in an endless time loop (think Groundhog Day or Edge of Tomorrow), and he has to use his knowledge to unlock the secrets of the mystery in order to avert it. While this is an interstellar exploration game, it’s not to be confused with No Man’s Sky. 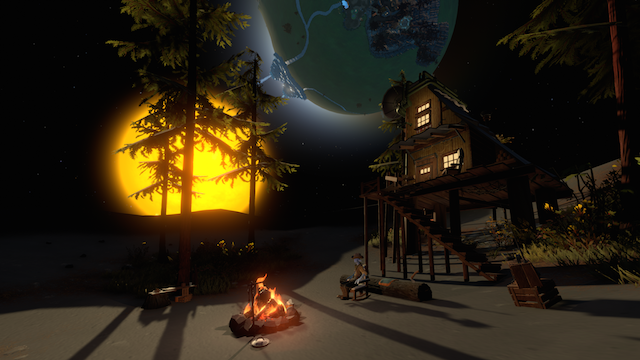 Outer Wilds has a very rustic look and style. The aliens are a very low-tech culture. Even the spaceship and equipment that the aliens use do not look all that technologically advanced. The designs and art direction have a somewhat simplistic, exaggerated style to them over a photo-realistic quality. The planets within the solar system are all very small, almost miniature planets. But the solar system operates as a dynamic character itself within the gameplay. The mystery at the center of Outer Wilds is definitely intriguing, and the game demo does a good job of encouraging you to uncover more secrets in order to unlock that mystery. Other than the somewhat clunky space navigation controls, the first-person controls worked rather well. And space waking in zero-g also offers a nice bit of fun. Outer Wilds is currently slated for a 2018 release for Windows PC. The game will likely become available on additional platforms later on, but those details are still being hashed out.